Arianna had only known the life of a country farm girl until that fateful day she defied her father and snuck into town. It was there that she found a man who needed her help, but by helping him, brought destruction to her family. A Wolverine Knight, Sir Geoffrey had been sent on a mission with two other knights. Honor dictated that he help Arianna, who had lost everything by aiding them in their quest, yet it was not honor that he felt towards her. He knew Arianna was in emotional turmoil due to her circumstances, and he would not take advantage of her. He refused to see love. Yet Arianna knew there had to be more. There was a bond between them. Neither of them recognized the truth, which was even more mysterious and magical than they could have imagined. 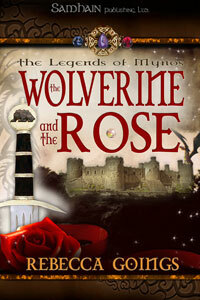 I was engrossed in The Wolverine and the Rose from the very beginning, and was not happy whenever I was interrupted. This story has it all. There is great romance, evil villains, magic, elves, and even a dragon who is one of the best surprises of any story I've read. I am thrilled to know that there will be more stories in this series (there is even a prequel on the author's website). I am anxious to read the next in the series.